The Star Wars franchise has always been so much bigger than just the movies, with merchandise, video games and a slew of Expanded Universe novels. Ever since Disney acquired LucasFilm in 2012, the galaxy far, far away has grown by leaps and bounds. While we wait for the first spinoff Rogue One (December 16, 2016) and Star Wars: Episode VIII (December 15, 2017), fans will be able to pick up the latest novel Star Wars: Bloodline, written by Claudia Gray, on May 3, one day before Star Wars Day. It follows General Leia's backstory leading into The Force Awakens. Today we have word that author Claudia Gray got some help with this story from none other than Star Wars 8 writer-director Rian Johnson. Claudia Gray's first Star Wars novel, Lost Stars, was published on Force Friday back in September, and this story is widely considered to be one of the best in the Journey to Star Wars: The Force Awakens book series. 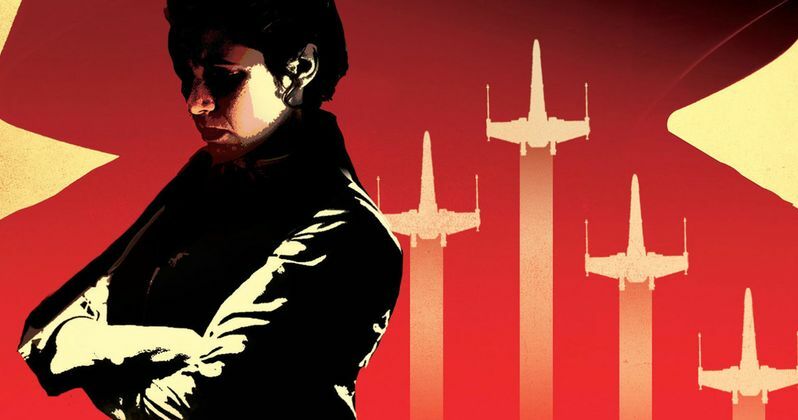 The author's new book, Star Wars: Bloodline, sheds new light on how the Resistance was founded, Han and Leia's relationship, plus the reveal of a huge secret about Darth Vader. StarWars.com posted a list of eight reasons fans should be excited for this novel, and one of which was that Rian Johnson came up with story ideas for the book. Here's what LucasFilm fiction editor Jen Heddle had to say in her article. "Some of the story ideas and elements in this novel came straight from Rian Johnson, director of the forthcoming Episode VIII. We are indebted to him for his creativity and generosity!" Of course, the extent of Rian Johnson's involvement in this book isn't known, and we likely won't know which story elements he came up with. This novel is set in the years before Star Wars: The Force Awakens, following Leia, who is now a respected Senator, as a movement is born to elect a First Senator, to bring leadership to the galaxy which has become more divided than ever. Since the story will be set years before Star Wars: The Force Awakens, it isn't known if any elements of this tale will cross over to Star Wars: Episode VIII. While very little is known about the story of Star Wars: Episode VIII, we know the sequel picks up right where Star Wars: The Force Awakens left off, with Rey (Daisy Ridley) meeting Luke Skywalker (Mark Hamill) for the first time. There have been rumors that Rey will begin her Jedi training with Luke on a remote planet, while Kylo Ren (Adam Driver) captures both Finn (John Boyega) and Poe Dameron (Oscar Isaac), in hopes of luring Rey to save them. We'll keep you posted with more on Star Wars: Episode VIII and Star Wars: Bloodline as soon as new details surface, but for now, you can check out new posters for the Star Wars: Bloodline book featuring both Leia and Darth Vader.